Pont du Loup's love affair with tourists began in 1840 when a small café was opened overlooking the waters of the river below. At this point the tiny village was known as Patarast, but in 1892 the viaduct was completed and in recognition the proud village took the name of Pont du Loup. This viaduct was an immense piece if engineering (see the picture on the right), with 11 columns set 20 metres apart and rising cathedral like above the waters some 53m below. The first train chugging high across the gorge must have been quite a sight for the locals and to then watch the descent of wealthy tourists into the village must have been surreal for this mountain backwater. It was the beginning of a tourist boom with the Hotel and Restaurant Dozol the first to cash in. It opened its doors in 1900, with a pretty terrace overlooking the road and village square. About the same time the little café across the road quickly expanded into the Café Restaurant du Chemin de Fer and in response to the number of visitors grew once again into the impressive Hotel Restaurant La Reserve in 1907 - even the name reflecting the discerning clientele that were drawn to the fashionable mountains and was no doubt the equivalent to the boutique hotels that are in favour today. In the same year, opposite the river to La Reserve, the Grand Hotel opened for business and in 1926 boasted such luxuries as electric light, a lift, and garage parking. Pretty impressive stuff for the year. And in a nod to the British clientele the restaurant was called 'Afternoon' - an early example of Franglais. 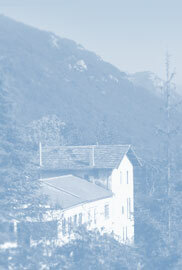 Finally, in 1912 the Auberge des Gorges du Loup opened as well and is the last to survive, but more on that later. Four hotels built within a few years in one miniscule village goes to show the popularity of the gorge, the mountains and the brilliant train journey to reach them. This fashion, much like the rise of the Victorian spa towns of Great Britain, centred around the health benefits of the mountain air and waters. 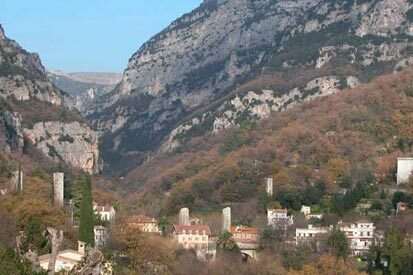 Queen Victoria was a regular visitor, she loved this entire area, and the square in Gourdon overlooking the gorge is named after her. The only other industry appeared when the disused water mill was converted into a Perfume Factory, in response to the huge demand for the local scents that remain as important today. But of course War came, and in the Second World War the German occupied village shrank back to the sleepy place it had once been. With the fall of the Nazis came disaster and an end to its short lived fame; on hearing they'd lost the war the retreating German troops blew up the beautiful viaduct, taking with it part of the perfume factory that had employed so many locals. With post war austerity, fickle tourist fashion switching to the coast, and with the train gone, Pont du Loup didn't stand a chance. Hotel La Reserve battled on until 1990 - when a bizarre sequence of events took place. Masked men entered the building, escorted staff and guests to safety and then blew up the structural supports with dynamite. You can only guess the new owner upset the wrong people - such a shame and such a waste; with structural damage it still stands just as it was left. The Grand Hotel was converted into the local school and remains as such today. Hotel Dozol went into rapid decline also, closing as accommodation after the war, closing as a restaurant in the seventies and then even the bar gave up in the nineties. Mother and daughter descendants of the hoteliers are living out their lives in dusty building. Just the Auberge remains in good health, and has since been joined by a tabac and the Brasserie de la Source offering good value plat du jour's. The old mill/perfume factory switched trades and began making sweets, and it's this that is the primary draw for tourists today - still owned by the famous Florian perfume family the Confiserie Florian is worth a visit if you've a sweet tooth. They offer a free tour and free tasting, and hope that afterwards you'll stock up on their jellied fruits, jams, crystallised flowers and chocolates - which after a tasting is pretty much a given! However, the 2 closed hotels remain a sad sight and it's criminal that the maire has allowed them to remain empty and unloved for so long. With the coast becoming overcrowded the fashion does seem to be going full circle and the mountains are becoming increasingly popular once again - fingers crossed this will spur someone into restoring these 2 fabulous pieces of Provencal history. GOOD NEWS: Hotel La Reserve has been bought to be restored as apartments - shame it won't be a restaurant, but good to see it being loved again. Plus the Confiserie has opened a cookery school and brasserie - things are starting to look up for Pont du Loup.